Johnny Depp stars in his sixth movie for director Tim Burton, as the titular Sweeney Todd: The Demon Barber of Fleet Street . His other films with Burton include Edward Scissorhands , Ed Wood , and Charlie and the Chocolate Factory . When surveying Burton's work it is evident that his collaborations with Depp are often his most artistically successful ventures. Sweeney Todd, a musical, is no different. It is a fine addition to Burton's oeuvre. And there is no doubt that Depp gets the childlike sensibility that his director is seeking. In Todd , Benjamin Barker, once a promising young barber with a wife and daughter, was sent to prison unjustly by evil Judge Turpin (Alan Rickman). Though he was an innocent, Turpin had designs on stealing Barker's family for his own. Apparently, Barker's wife died while he was away. Now, the insidious Turpin seeks to make Barker's daughter Johanna (Jayne Wisener) his young bride. Returning from prison in the guise of Sweeney Todd, he seeks revenge on Turpin - and London society, for their complicity in sending him to prison. Mrs. Lovett (Helena Bonham Carter), a local pie-maker, conspires with Todd in his quest for revenge, selling pies made out of all the victims of Todd's chair. Sweeney Todd is a master barber, of course... the better to lure his prey into the chair. Like Todd, Depp's characters in Burton's films are frequently childlike outcasts with some distinctive talent. The eponymous Ed Wood is a second-rate film director that nonetheless has the ability to bring all sorts of freaks and misfits together to turn his vision into a film. Willy Wonka is adept at his work as a chocolatier. Edward Scissorhands can style hair AND shrubbery with ease. It is easy to see why the odd-looking Burton may identify with his protagonists as portrayed by Depp. Perhaps the most obvious component of Depp's characters that resemble Burton is their appearance. Burton's sullen demeanor, wild hair, pallor, and dark-pitted eyes are depicted in most of Depp's personifications. Sleepy Hollow's Ichabod Crane is pale, while Willy Wonka is so white he's blue. Edward Scissorhands has an exaggerated reimagination of all of the director's physical characteristics. And Sweeney Todd, his shock of gray hair notwithstanding, is an idealized version of Burton himself... gothically handsome, but still wild-haired, pale, and sullen with sunken eyes. Each of Depp's performances bear a resemblance to Burton in a much more important way than in their physical traits. Each is a stunted man-child delineated much more clearly by Depp than any of Burton's other alter egos. Ewan McGregor in Big Fish is obviously immature, but we don't get the tilted Burton sensibility in his portrayal. His performance has more in common with those of any number of film characters nostalgically reliving their pasts through tall tales like Terry Gilliam's Baron Munchausen . Michael Keaton, who has played Beetlejuice and Batman for Burton, has a darker more cynical take on Burton's protagonists. His performances eliminate Depp's capacity for childlike expressiveness so evident in Depp's eyes. Keaton's Beetlejuice is a hard-living (or unliving, as the case may be) wisecracker. Keaton's Batman is about stoic non-expressiveness. His Bruce Wayne died when he was a child leaving only the vigilante Batman. Even Depp's murderous Todd still uses the bitterness only to mask the wounded child within. We finally get a glimpse of that child at the end of the film, when he realizes the futility of his revenge, and let's his defenses down in defeat. 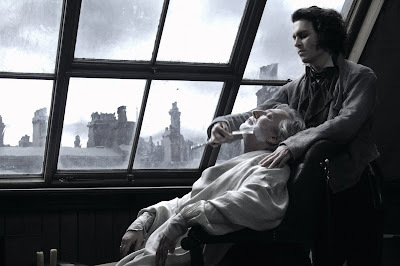 Sweeney Todd is a high point in Depp and Burton's collaboration. The DVD has a wealth of special features about the film, Stephen Sondheim's stage musical, and even the urban myth from which Todd is historically derived. I highly recommend it.